Darico transcends the simple functionality of the Bitcoin and the role of gold in traditional capital markets. Darico embodies a unique position with its combination of assets as a base. The coin is setup to achieve its goal by solving the shortcomings of traditional economic systems and gaining a high degree of adoption and liquidity of emerging systems. Being backed by gold, Bitcoin and Ether makes Darico an excellent hedging and long term investment alternative for cryptocurrency lovers who want to diversify their portfolio. What does D A R I C O stand for? What are the basket of assets that back up Darico? What are the critical problems Darico is aiming to solve in the cryptocurrency market? Isn’t Volatility important to generate profit? Yes, however high volatility generates extremely high risk in your portfolio, which means that you will see an extreme swing between profit and loss within a short time frame, which is unhealthy for the overall portfolio and eventually leads to huge losses if the investment fails. Darico provides controlled volatility. This means that you are more likely to make stable, consistent profit over-time, which will enable your portfolio to grow with minimal risk. How does Darico overcome the risk of high volatility? Darico is diversified by its very nature, especially with the inclusion of gold as an asset in its founding portfolio (gold will make up 35% of Darico). Because of this structure, we can control the risk while still benefiting from high profits when the cryptocurrency market booms. How does Darico overcome the problem of “high positive correlation”? Because Darico is backed by the two dominant cryptocurrencies in today’s market (Bitcoin & Ethereum) and the most secure and stable asset, gold, it provides investors with an opportunity for stable and consistent growth without fear of exorbitant losses should the cryptocurrency markets plummet. Why is Darico more liquid than other Cryptocurrencies? During the initial phases, all Darico Coins are 100% backed by gold, which is a “safe haven” asset with a market cap of around US$7 Trillion, in combination with the two most liquid Cryptocurrencies in today’s market (Bitcoin & Ethereum). This makes Darico highly liquid, thus resolving the illiquidity problem facing the overall cryptocurrency sector. In addition to that, Darico’s transaction confirmation takes approximately 15 seconds. This gives investors the tools to capture opportunities and make the most of Darico. 55 % Bitcoin = Being the dominant cryptocurrency in the market, we expect that any market booms will start with Bitcoin. To date, we have already seen an increase of more than 1,000% in the Bitcoin price since 2016. 10% Ethereum = Darico is based on the Ethereum Blockchain combined with the fact that Ethereum grew more than 3,000% from 2016 to date. By including a minority percentage of Ethereum we’re more likely to capture the gains made by the wider crypto sector. 35% Gold = An asset that has been considered a safe haven throughout time. By including gold, we’re minimizing the risks while remaining open to large price rises. Gold helps us deliver stable and consistent growth. What is the ticker symbol for Darico Coin? What are Darico Genesis Accounts and their features? Darico Genesis Accounts (DRX) are a reward for every 1,000 Darico bought during the ICO phase. Genesis Accounts (DRX) emit Darico over time in a process called Auto Mining. These bonus coins will be available to claim directly from the application, which means you will be generating additional Darico just by having the accounts. What amount of Darico is offered in the ICO? 60 Million Darico will be sold within a 6 month duration, with each tier yielding more bonus DRC than the previous one. However, if by the end of the ICO we haven’t achieved our goal of selling 60 Million Darico, the excess coins will be burnt in order to preserve value and keep our investors safe. What is the minimum amount of Darico (DRC) that can be bought during the pre-ICO? 1,000 DRC is the minimum amount, which means the minimum investment is 9.1 ETH. What is the accepted method of payment for Darico (DRC) during the ICO? We will only accept payments in ETH & BTC. How will I store my Darico (DRC) and Genesis Account (DRX)? Darico will provide a state of the art application which will allow users to have the ability to do multiple tasks, please refer to the list below. HUB to store all the Ethereum Based Coins. Quick transactions from/to any addresses. Validating system to check if the address you’re sending funds to is trustworthy and reputable. Contact list to add all the public addresses you usually send/receive coins. Integrated exchange platform to exchange between cryptocurrencies with ease. Private key to access the wallet offline & increase security for your funds. Loan system to benefit from the provision of Smart Loans in order to earn more Darico. Real-time monitoring and tracking system that shows the activity of your DRX and the mining process. Update section to ensure you are always up-to-date with the latest developments at Darico. A section to monitor your total portfolio and its movements. Where do I participate in the Bounty Campaign? What is the point of Darico when I can just buy BTC, gold or ETH separately myself? Point of Entry :- The buy price of Darico is way less than the price of each individual asset. This is because of the amount of assets that backs Darico in the beginning phases, which means that as the value of the underlying assets increase it will increase the price of Darico overtime. Hedging Risk :- Darico being a basket of assets that is made from Digital Assets (Ether & Bitcoin) along with Physical Assets (Gold) which acts as a way to hedge the overall risk of high volatility. By having Darico you are going to have high profits while maintaining minimal risk. Use Cases :- Darico is not only a basket of assets, it has multiple use cases which will be introduced throughout the project lifetime. This will enable investors to use Darico in various ways and will always drive demand for Darico, which will increase the price over time. If this is a coin for people who are new to cryptocurrency, but you still need to own btc or eth to buy the coin, what makes it easier/what’s the point? The idea of buying Darico (DRC) with Bitcoin (BTC) & Ether (ETH) is based on the fact that the legal structure to trade directly from Fiat Currency to Darico is still not in place. However, we are working on enabling this feature as soon as the legal documents are set in place. How do I ‘redeem’ the gold that I’m buying? 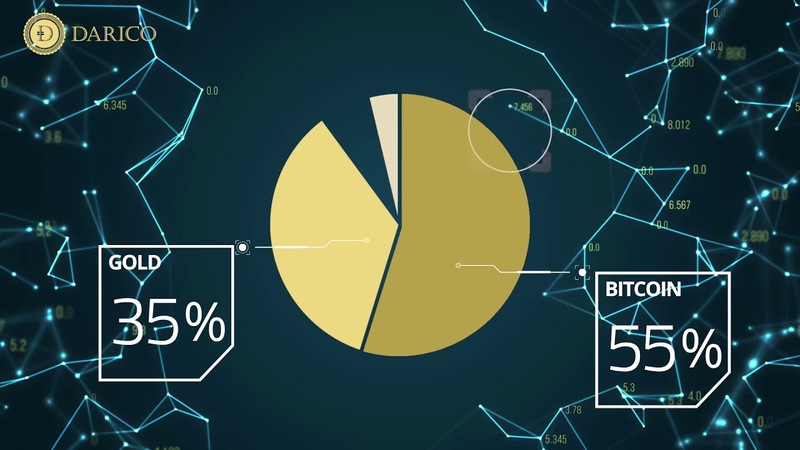 Darico is a basket of assets which means that once an investor invests in Darico the money invested is split into 55% Bitcoin, 10% Ether and 35% Gold which will create the value of Darico at the beginning stages. You can’t redeem any of the underlying assets using Darico, however you can freely trade Darico to any other cryptocurrencies that are available on the exchanges. What is the price of Darico? The price of Darico depends on the stage of the ICO as we have scheduled different bonuses throughout the ICO which will last for 6 month. The earlier you invest in Darico the better bonus you will be rewarded. Please refer to the structure above to find the exact exchange rate between Darico and Ether which will help you determine the current price of Darico by following the current price of Ether in the market. Is Darico a security token or a utility token? Darico is a combination of both. Being a basket of assets it puts you in a position to gain over time when the overall basket appreciates in value. In the future through the case uses that are to be implemented (see whitepaper for further details), Darico holders will be able to use Darico in multiple scenarios.